Multiple videos featuring David Hogg, a survivor of the mass shooting in Parkland, Fla., have surfaced amidst his rise to prominence as an anti-gun activist that have raised questions, including a television news report in California last year. 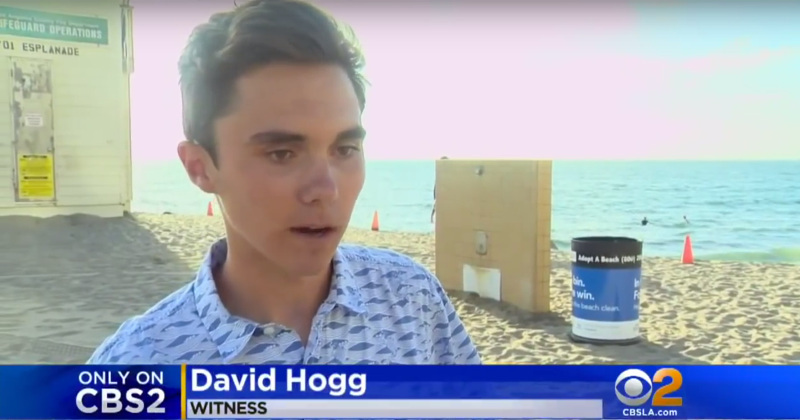 CBS Los Angeles featured Hogg as the eyewitness and videographer of a testy encounter between Hogg, a veteran Redondo Beach, Calif., lifeguard and a surfer, who was reportedly Hogg’s friend, in August of 2017. Hogg claimed the lifeguard accosted his surfer friend over the issue of resting a sandy bodyboard on a beach trash can. Interestingly, Hogg has reconnected with CBS for an appearance on CBS This Morning as the mainstream media unabashedly features high school students as figureheads for a new anti-gun push. A CBS employee posted a photo of Hogg with fellow teen activists and CBS reporter Gisela Perez, which was later taken down after Kristinn Taylor of The Gateway Pundit reported on the photo shoot and how strange it seemed that all parties looked so cheerful and enthusiastic in the wake of such a tragedy. Additionally, another video has surfaced that appears to show Hogg being walked through rehearsed lines in an interview after the shooting. This uncovered video of teen anti-Trump/anti-gun activist David Hogg, which shows he was heavily coached on lines and is having trouble reciting his script, is being REMOVED and CENSORED from social media and YouTube. They don't want anyone else to see it. Some have wondered if Hogg and fellow activist Emma Gonzalez were being coached through this strange interview on CNN in which both teens demanded the abolition of the National Rifle Association. Hogg and company will be holding a town hall this week, which will be broadcast by CNN and moderated by Jake Tapper. Hogg has become an overnight celebrity, appearing on international media outlets and television shows, vehemently calling for strict gun control, regularly slamming President Trump, and defending the FBI – of which his father is a retired agent, which many have found to be a peculiar coincidence as the FBI has come under fire for not preventing the Parkland massacre despite being warned about suspected killer Nikolas Cruz repeatedly beforehand.